In this month’s article, Mike Farahbakhshian lets his OCD get the best of him, and explores all the overlooked effects and loose ends of the VA’s upcoming Cerner procurement. It’s all those little bothersome thoughts about the matter hovering around the back of your consciousness, put to text. Time to read: 12 minutes. Suggested drink pairing: mint julep. It’s summer! Sorry, Patrick. SecVA has spoken. After years of speculation and rumors, in a move that surprised absolutely no one, Veterans Affairs Secretary David Shulkin announced that the Department of Veterans Affairs is moving to Cerner Millenium to replace its home-grown VistA electronic health record. On the surface this makes sense, because of DoD’s move to Cerner in 2015 and an overarching VA desire to move from custom software to COTS software. Preventative, long term, and palliative health care; you can be medically discharged from active duty, but even the sickest Veteran is still a Veteran. Serving as a network of hospitals of last resort in case of domestic emergency. After no more healthcare can be given, VA provides and maintains a Veteran (or Veteran’s dependent) memorial plot.. While this may not seem germane to a Healthcare IT article, it’s a potent reminder that a Veteran’s lifetime record actually goes beyond their lifetime, as certain data elements must be maintained in perpetuity. Love it or hate it, (and most healthcare providers in VA seem to love it) VistA evolved over the past few decades to support these many and varied missions, with clinical modules that address things like long-term and chronic conditions; masking of protected conditions such as HIV or Sickle Cell in accordance with 38USC7332; non-clinical modules that access health information to qualify financial or benefits information (such as CAPRI); administrative modules for capital expenditures (IFCAP), facilities engineering and asset management (AEMS-MERS), and modules that schedule police shifts at VA hospitals. The big take-aways here are threefold: First, VA’s “rules” for provision of health care are significantly more complex than DoD’s or those of the commercial world, and are based on a series of federal laws dealing with Veteran eligibility and masking of Veteran health information. Second, VistA is far more than an Electronic Health Record. It is a full-blown Hospital Information System with elements of an Enterprise Resource Planning or a Construction and Facilities Management software suite. Finally, the VA’s data retention requirements will mean retaining certain data elements in perpetuity – in theory, if the United States lasts for another ten thousand years, we will still need to know the names and plot locations of our many deceased Veterans. VistA was designed first and foremost as a clinical workflow system at heart, with the billing components bolted on; the remainder of EHRs were built as a billing system first, with the clinical components bolted on. With this in mind, it seems like there is a daunting task ahead of VA. As an unrepentant VistA fanboy (or, conversely, someone who has Stockholm Syndrome from being in Federal Health IT for 20 years), I naturally have a few questions that VA stakeholders will need to hear and keep in mind as they move down this path to modernization. What about the non-clinical modules? We’ve established that there are several modules in VistA that are not part of a health record, but rather are related to hospital administration. If VA moves from VistA to Cerner Millenium, the functionality of every one of these modules, in their full current functionality, must be accounted for. Now to be fair, there are current attempts at modernization, although these are often piecemeal. For example, VA is currently trying to replace the asset management components of AEMS-MERS with the IBM Maximo product. Yet there are other components of AEMS-MERS that require an entire facilities management system (such as Tririga) or a full-blown Enterprise Resource Planning (ERP) product. What is the VA’s plan to retain this functionality? What is their roadmap? Will they keep VistA on as a hospital management system? Or will VA perform one or more other procurements for the remaining VistA functionality? If so, what is the price tag to replace VistA’s administrative modules with an ERP in every VA hospital and outpatient clinic? If you aren’t uneasy at this “price tag” question, you should be, because the price tag for Cerner alone at VA is yet unknown. People are saying it will be multiple times the DoD price – which I might remind you was $4.3 billion dollars. Moreover, this as-yet-unknown price tag isn’t just the sticker price of the product, it’s the costs of interfacing all of the systems, as well as time and materials for a system integration. None of this even scratches the surface of time and money spent debugging data quality issues as these various systems try to speak to each other using a variety of protocols including SOAP, RESTful methods, JSON, and HL7, with or without FHIR. It should be noted that VA currently has several “enterprise services buses” to handle inter-app messaging. These enterprise applications include Electronic Messaging Infrastructure (eMI) based on IBM WebSphere, VLER Data Access Services (DAS), and Vitria Businessware. If VA hasn’t standardized on one system, be it COTS-based (eMI, Businessware) or GOTS (DAS), then the bottom line is this: it’s not promising that VA has no plan to address a coming crisis. This crisis is based on the astronomical costs of a wide array of yet-to-be-determined ancillary systems, each with a yet-to-be-determined price tag, serving a yet-to-be-procured EHR with a yet-to-be-determined price tag. The cynical response is, “well, at least there will be business for system integrators for some time to come.” And this is true. Yet as a taxpayer, there’s something awry with this. Is it too much to ask to know what you are replacing before you replace it, and how much the replacements will cost? Okay, okay, I know I’ve spooked you with all this talk of capital expenditures and facilities management and ERP. Let’s handwave it away for a second and focus only on the clinical aspects of an EHR. What is a key component of any electronic health record? Scheduling. Not just scheduling patients, but scheduling resources: doctors, equipment, operating rooms. What does the VA struggle with? I’ll give you one guess. That’s right, it’s scheduling. VA really struggles with scheduling. It makes the news, multiple times. With that in mind, what is the VA’s plan for enterprise scheduling? Are they using Cerner functionality? Does Cerner encapsulate all that functionality? Or will they double down on their expansion of an Epic pilot as part of the MASS IDIQ? Bottom line: what is VA doing here? What is the point of moving from an integrated, albeit custom product, to this: not one, but two COTS products, with their own Venn diagram of overlapping and excluded functionality, and the resultant cost and headache of integrating them? To clarify: I am not advocating a best-of-suite or best-of-breed solution. Both have their merits and their drawbacks. What I am pointing out is the obvious: it looks like there hasn’t been a lot of forward thinking in this regard; or, if there has been, it’s being kept very close to the vest. Okay, okay, you’re sick and tired of hearing what VA has been doing wrong. Let’s talk about one area where they are doing things right. Namely, VA sits at the leading edge of Medicine in the treatment of chronic conditions. Not this type of “chronic,” though the VA is piloting medical marijuana for treatment of PTSD and other issues. If you think about it, Veterans are one of the most diverse medical populations. As they’re in the health system for life (and in the VA system forever), every kind of genetic, geriatric, or environmentally induced syndrome may be seen. This includes conditions that are rare within the general populace, such as torticollis from Agent Orange, Gulf War syndrome, exposure to burn pits, polytrauma or long-term effects of shrapnel-based traumatic brain injury (TBI). Systems like this require a truly longitudinal health record. In its own imperfect way, VistA has served as this record. So, what’s the plan once everything is moved to Cerner Millenium? DoD acknowledges that GENESIS does not currently handle chronic conditions, and that the legacy AHLTA and CHCS systems will have to remain for nearly a decade. Given VA’s seeming urgency in making this procurement decision, are they ready to commit to keeping VistA alive for a decade or more? If not – what will happen to the legacy data? How can we ensure seamless continuity of care for Veterans who face chronic conditions ranging from Type II diabetes to spinal cord injuries? When actions are urgent but massively complex, planning is super important. One must not give in to the temptation to rush. Can you imagine if JFK slapped together a moon shot in one year? Instead, he set the course in 1961 and we landed in 1969. I want to note here that the change from VistA to Cerner (and the Cerner posse of ancillary applications) has a more meaningful human cost than that of the space race: potentially, the health and livelihood of hundreds of thousands of Veterans hangs in the balance, not to mention the smooth processing of billions of dollars’ worth of educational, mortgage and benefits information that depend on a functioning health record. Bottom line: VA, don’t [email protected]#$ this up. This will take time. Even if it means keeping VistA around for another decade or more. Who will Enforce this Change? DoD has a chain of command. The decision to move from AHLTA/CHCS to Cerner is one that is enforceable by military justice. Among uniformed personnel, insubordination is punishable – in extreme cases, by execution. We expect the DoD staff to comply with directives from leadership, and unsurprisingly, they do. VA does not have the same culture with built-in enforcement of the chain of command. VistA itself was originally created by a widespread group of “rogue” VA clinicians and called it the Decentralized Hospital Computer Program. VA culture, much like Frontier America, is based on rugged individualism, going your own way, and occasionally burying your mistakes in shallow graves. VA clinicians in the trenches are motivated and engaged. They are strong and independent. And they ain’t need no management oversight from a Weberian hierarchy. 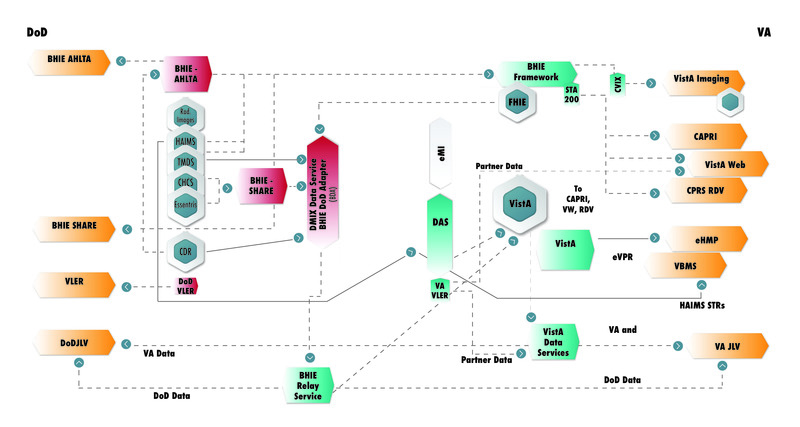 Individual Veterans Integrated Service Networks (VISNs) operate relatively independently from each other, with different operating structures. The Veterans Health Administration (VHA) often acts independently from the Veterans Benefits Administration (VBA), National Cemetery Administration (NCA) and VA Central Office (VACO). I mention this because it bears consideration. The VA’s fiercely independent culture is resistant to change. More importantly, I am not sure it should be changed; VA clinicians believe in their mission and the communities they serve, and directives from Washington bureaucrats are probably low on their list. That said, we need to be cognizant of these cultural aspects, because they will slow down adoption of everything: not just Cerner, but any of the modified or replaced products for administrative or scheduling functionality, and all the interfaces between them. Strong leadership must use a soft touch to canvas the support of VISN-level directors. This is something I’d implore SecVA to start with now. Dr. Shulkin was with VA as Undersecretary of Health for less than two years before being promoted to SecVA. That’s not a lot of time to get to know – or, more cynically, ingratiate oneself with – the vast number of VISN directors, CIOs and Chiefs of Staff. My suggestion to Dr. Shulkin? 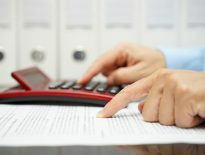 Time to get to know your reports; you will need their buy-in if this rollout is to move smoothly. This is one that I have asked multiple VA stakeholders about and only received rolling eyes or shrugs. You see, right now DoD and VA communicate through a system called the Bidirectional Health Information Exchange. The centerpiece of the current BHIE system is a cluster of HP Itaniums running InterSystems Caché. This cluster is known as “Station 200” and presents as a VA system to VA consumers, and as a CHCS system to DHA consumers. 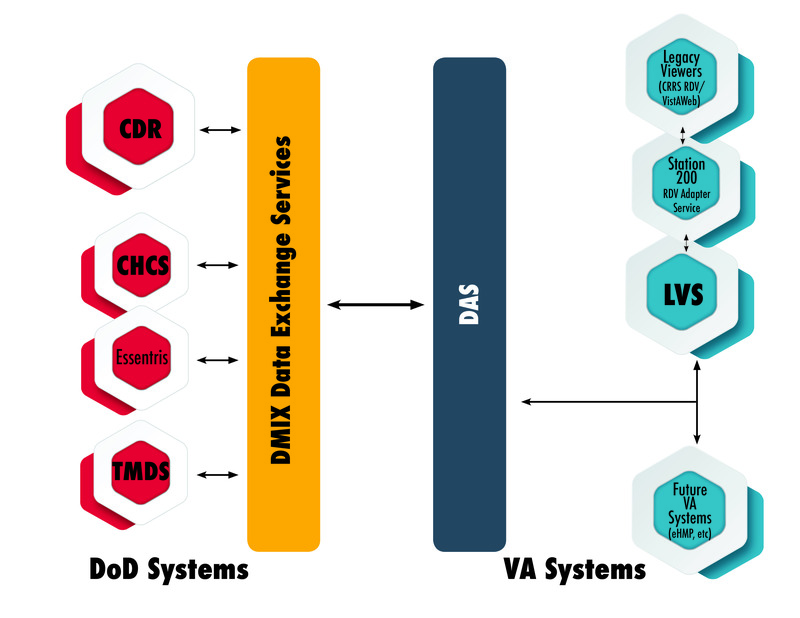 There is a long and rather well-thought out plan to replace BHIE, which includes hooking up the DoD Data Exchange Service (DES) to the VA VLER Data Access Service (DAS). It also has implications for Joint Legacy Viewer, the DoD Health Artifact and Image Managing System (HAIMS), VistA Imaging, and more. It seems logical that with DHA switching to Cerner and VA switching to Cerner, that all interagency interoperability would happen exclusively on the backend. Yet right now, as of today, there is no plan for direct backend communication. As such, records would be bidirectionally accessed via the DES <-> DAS hookup, which means a trip from a Cerner data center to DoD networks to VA networks and back to the same Cerner data center. In the eye of this data hurricane… is Station 200. When every VistA and CHCS system lies in read-only mode, or dormant, or powered off forever, what will be the fate of Station 200? More abstractly, how does the Government plan to take advantage of economies of scale now that the same vendor is powering two health record systems? In theory, Station 200 will be modified to be an “adapter service” for the Legacy Viewer Service (LVS), which will hook to VLER DAS and VLER DAS in turn to DoD DES. Station 200 will “spoof” data as if it were coming from CHCS to match todays as-is BHIE data. No one I’ve asked knows for sure. And it’s an easy detail to overlook. Let’s avoid a “Y2K” problem and remind DoD and VA leadership that right now there is a legacy system critically linking two modernized agency-wide initiatives and no clear plan to modernize it. So there you have it. I’ve taken all my little, “what about this loose end?” thoughts and put them on paper. For the more seasoned professionals here, nothing here will come as a surprise. Many of you will suggest medication to soothe my tendencies. I want to go on the record here and say, if anything on Earth should be given the ominous name “STATION 200,” this should be it. Yet nothing I’ve mentioned is rocket science. Migrating from VistA to Cerner isn’t as complex – or as consequential — as running the Large Hadron Collider. We do not require unique talents, Rockstar developers or a perfect combination of stars to align. What VA, and the Federal Health IT community at large, needs is patience and forethought. We cannot give in to the temptation of quick or easy solutions. We are unraveling a massive, aged, frayed tapestry where seemingly loose threads hold together a big portion of the picture. I’m pointing out just a few of these threads, and folks much smarter and more experienced than me should point out even more. At the same time, we are weaving another tapestry in, one that promises to be brighter and stronger. We need to make sure new threads replace old ones. We need to remind ourselves, every day, that these loose ends must be remembered, and kept continually in mind. We must think of the moon landing – this is something that be completed on the order of decades, not months or years. It may not be what you want to hear. It may not be what SecVA or POTUS want. Yet careful, methodical, planned action is exactly what needs to be done. Timely analysis, Mike. NIce perspective–and a good read! 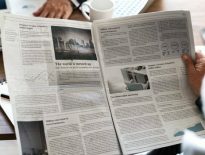 A very good article which really raises some good points. Excellent points – something not mentioned is IHS – Indian Health Service – relies on the VA’s VistA system for their Electronic Health Record system. IHS provides medical & health services to millions of American Indian and Alaskan Native people, on less than 5% of the VA’s budget. The cost to convert just IHS’s federal hospitals and clinics (160+) to Cerner could be a double-digit percentage of our entire budget. Most of our Tribal (read: non Federal) facilities haven’t the funding available to switch, either. What do we tell our Native population and facilities… Go back to paper? Great article–particularly that bottom line. Don’t [email protected]#$ this up VA!